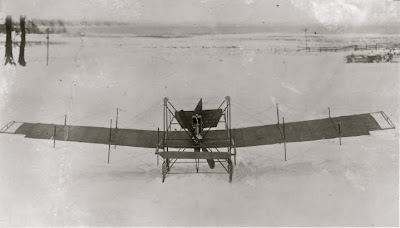 Courier April 3 1910 For the first time in history man has flown in Buffalo in a heavier than air machine. 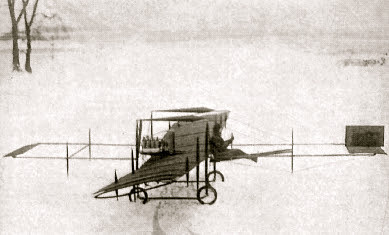 Albert L. Pfitzner of Hammondsport New York made three short flights over the golf links of the Country Club yesterday; two of them entirely successful and the third marred only by a slight accident in which the tires were ripped off the monoplane's wheels, and one of the wooden shafts of the forward steering gear was broken in landing. 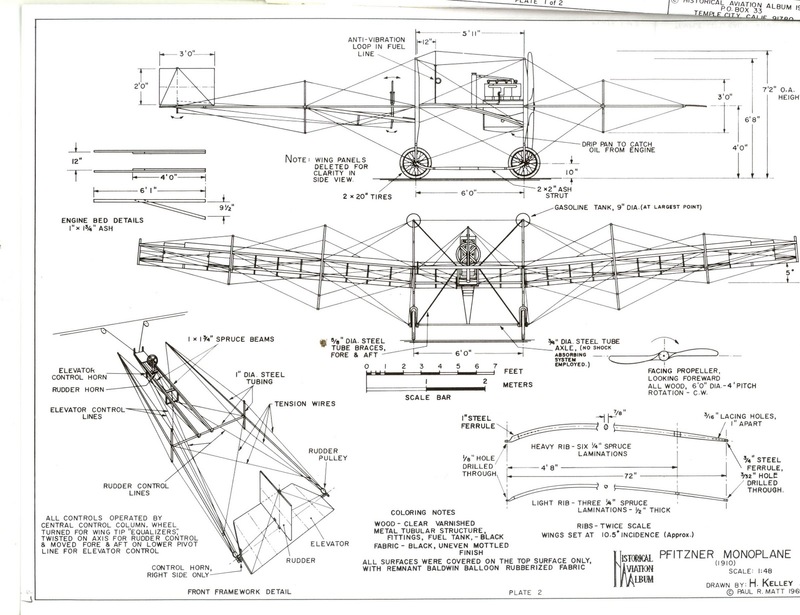 This is the aeroplane of Mr. Pfitzner's invention and make, which attracted so much attention at the recent Sportsman Show. 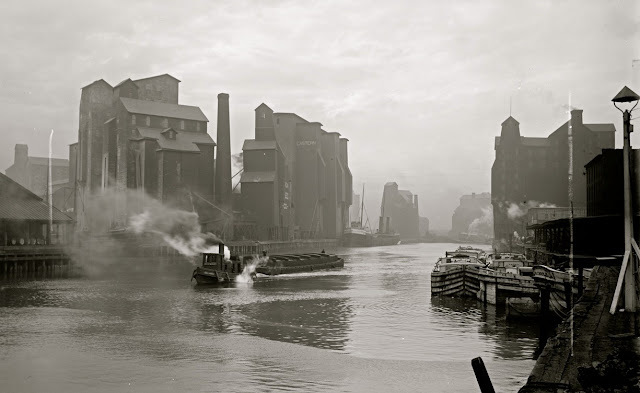 Being purely experimental and the aviator of a retiring disposition, the general public was kept in ignorance, and not more than 25 people all told were on hand at this great epoch in the Queen City's life. Besides Mr. Phitzner himself, his mechanic and a tensely interested group of attendants of the club, caddies, gardeners and the like, there were present Ralph H. Sidway, his wife, his brother C.S. Sidway, James B. How and Dr. K. S. Eschelmann. Carefully the great black machine was trundled into place on the big field back of the club house, and the engine set going. It was a perfect morning, windless and bright--and ideal day for a flight. The little knot of spectators gathered as close as they dared, the mechanics dodged away from the whirling propeller, and the birdman climbed into his tiny seat, resting his outstretched feet in the sling. "There he goes!" said somebody in the little group in a strained whisper as the holders sprang back and the machine started forward along the uneven ground with a rush. Then there was dead silence save for the sound of the engine. The blades of the six foot propeller made no sound at all. Ones first impression was of disappointment. Was this great awkward thing bumbling over the ground like a crazy automobile, one of the graceful airships so often written about? And Then--then Mr. Pfitzner pulled the wheel toward him slightly and the miracle happened. The clumsy, stiff-winged nightmare slid off the earth into the air, where instantly every trace of stiffness was lost. There was a slight rustling among the rigidly standing spectators, a little start and a soft, long-drawn "Oooh!" of amazement and delight as the uninteresting, strangely shaped contrivance of rubber and wood and wire became in a flash a thing of life, rising swiftly and with surpassing grace into it's own element. It is utterly impossible to gather an idea of an aeroplane from the photograph. It is the swift light movement that is so wonderful, it's truly birdlike appearance. 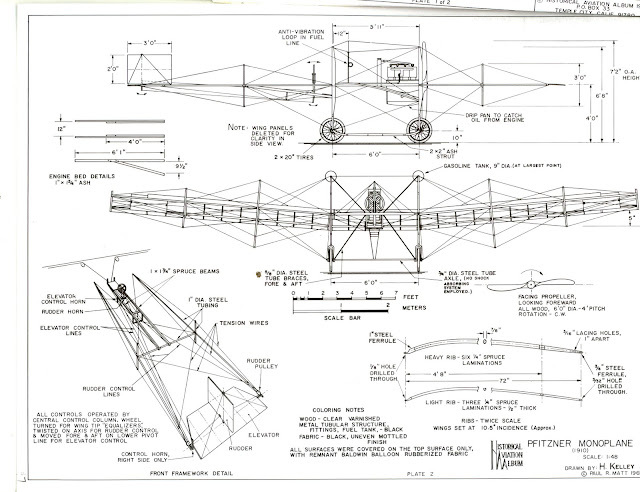 For the monoplane is very much like a huge bird, as one sees it as motion in air. The wings are rigid, it is true, but the movement is exactly that of a swallow or, in the case of Pfitzner's machine, of some other swallow-like bird with a long neck. And the thundering of the motor is nearly inaudible from the ground, so the machine could almost be likened to a shadow. It was on the aviators third flight, which seemed more promising than the others, that the accident occurred. He was going at a high rate of speed when he decided to descend, and struck the ground a little too hard. The aeroplane bounded off again, slued round and landed sideways, canting over slightly, tearing off the tires and snapping off a control shaft. Mr. Pfitzner expects to have all the damage repaired by tomorrow when, if weather permits, another flight may be attempted. 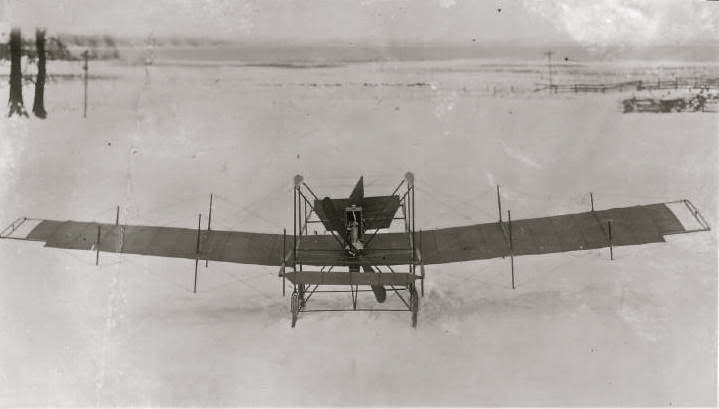 Editor's Note: In the early part of January, 1910, the monoplane designed by Mr. A. L. Pfitzner and built at the Curtiss aeroplane factory at Hammondsport, N. Y., was completed and flown. The first successful monoplane in America. Just three months later Buffalo's Aero Club sponsored this first airplane flight in Buffalo, from the Country Club polo field at Main and Bailey, April 2nd 1910. 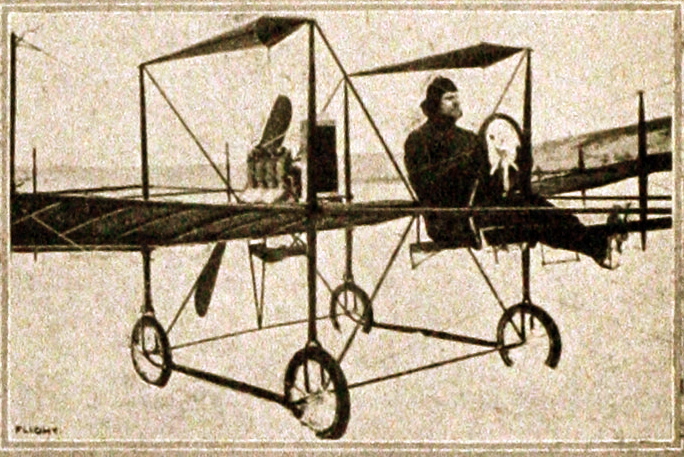 Alexander (Sandor) L. Pfitzner (August 5, 1880 – July 7, 1910) was a Hungarian engineer, inventor and aviation pioneer. After studying at the Hungarian University of Technology and serving in the Hungarian Army as an artillery officer, he emigrated to the United States, where he pursued a career as a designer of automobile and aircraft engines. Pfitzner worked for several automobile manufacturers before starting with the Curtiss Aeroplane and Motor Company. He designed and built the gasoline engine with which Curtiss won the overall speed event in 1909 Gordon Bennett Cup in Rheims, France. He designed and flew this first American monoplane, the Pfitzner Flyer. 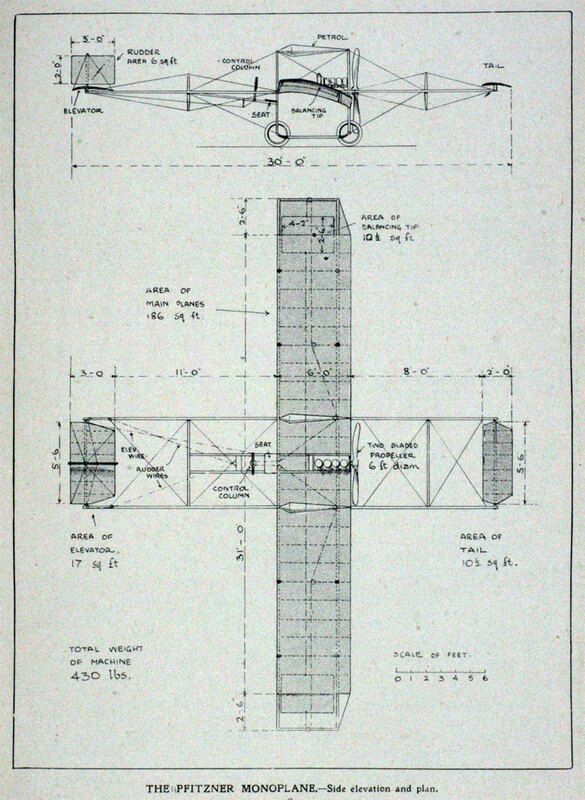 Frustrated by the efforts of the Wright Brothers' use of the courts to dominate the developing market for powered flight, Pfitzner designed his own aircraft, the Pfitzner Flyer, which avoided the Wrights' method of warping the wings to achieve a lift differential between port and starboard wings by using wing extensions (or 'compensators'). 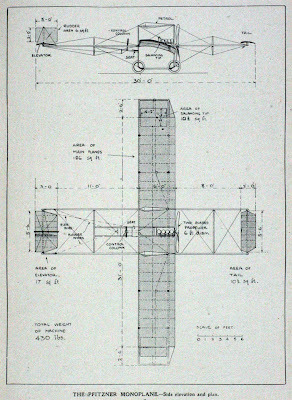 In his book "Monoplanes and Biplanes: Their Design, Construction and Operation" (1911), Grover Loaning wrote "This aeroplane is a distinct departure from all other monoplanes in the placing of the motor, aviator, and rudders, and in the comparatively simple and efficient method of transverse control by sliding surfaces, applied here for the first time"
Apparently depressed by its lack of success, he is reported to have committed suicide in July, 1910, although his body was never found. Following his death, reports spread that some of his friends had sighted him in New York City.